LOS BAÑOS, Philippines—The head of the Philippines' food security and agricultural modernization agency has expressed her concern over the impending lifting of the trade restrictions on rice. To 'insulate' the local rice market from rice imports, the Philippines maintains government quotas on them, a measure discouraged under the international trade agreements with the World Trade Organization (WTO) and the Association of Southeast Asian Nations (ASEAN). By June 2017, the country's quantitative restriction (QR) on rice imports will be lifted. "What will happen to our farmers?” Edel Guiza, secretary of the Presidential Assistant for Food Security and Agricultural Modernization, asked this during her visit to the International Rice Research Institute (IRRI) on 19 May. “We have been discussing possible schemes together with the National Food Authority on what mechanisms we can put in place." Dr. Bruce Tolentino, IRRI's deputy director general for communication and partnerships, concurred that the country has no choice to lift the restrictions because the WTO will not agree to another extension of the QR. However, he raised an important point on providing ways to support farmers other than through a QR. “One of the reasons why the country's rice is not as competitive as the commodity is in Vietnam, Thailand, and other rice-producing countries is the high cost of production,” Tolentino said. "This can mostly be attributed to our high labor costs because food is expensive. Why is food expensive? Because rice prices are high. Once we're able to manage rice production and make it less expensive and comparable to, say, Vietnam, we will then be able to manage production costs." LOS BAÑOS, LAGUNA, Philippines—The head of the Philippines' food security and agricultural modernization agency is considering using a water-saving technology developed at the International Rice Research Institute (IRRI) for the country’s national irrigation. 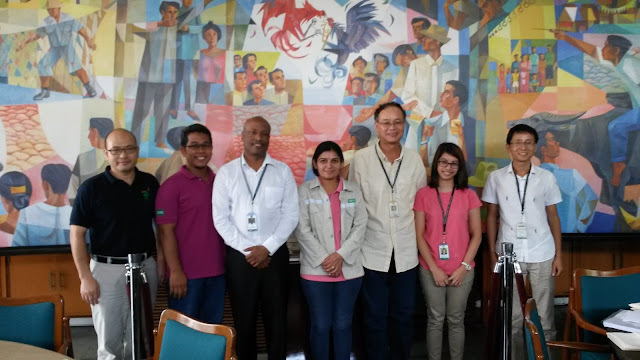 Edel Guiza, secretary of the Presidential Assistant for Food Security and Agricultural Modernization, visited IRRI on 19 May to study measures that will help the government assist rice farmers affected by the El Niño-induced drought in the southern Philippines. Guiza, along with officials of the National Irrigation Administration and the National Food Authority, were briefed on the water-saving technology called alternate wetting and drying (AWD) by Bruce Tolentino, IRRI deputy director general for communication and partnerships; and James Quilty and Jun Correa, head and field operations manager, respectively, of the Zeigler Experiment Station. AWD helps farmers reduce the amount of water they use by eliminating the traditional method of keeping their rice fields continuously flooded. Instead, the water level is allowed to drop to 10–15 cm below the soil surface before reflooding the field. A perforated water tube, which could be made from PVC pipes or bamboo, is used for farmers to monitor the water level below the soil. AWD is regarded as one of the more important rice cultivation methods that can dramatically save freshwater irrigation in the coming decades. It not only conserves water but also mitigates greenhouse gas emissions while maintaining rice yields. But in some countries, its adoption by farmers remains limited. Guiza noted that the success of AWD largely depends on the kind of irrigation system involved. For example, national irrigation systems have irrigation service fees, which can directly benefit from reduced costs through AWD. But, in communal irrigation systems, the farmers collect the water fees themselves, which are then collected by the national system, making the situation a bit more complicated for AWD adoption. "We want to revisit the irrigation service fees,” Guiza said. “Then there is the irrigation management process, which has five irrigation models. That means it's not easy to shift right away because there are policy implications." ALABANG, Philippines—Cultivating climate-smart rice varieties in unfavorable environments could boost local rice production, says Edilberto de Luna, Philippine agriculture assistant secretary for operations (photo left). De Luna said this during a meeting with rice department heads and scientists from 10 Asian countries on rainfed rice farming areas that often experience low productivity, poverty, and hunger. The discussion took part during the 15th Annual Steering Committee Meeting of the Consortium for Unfavorable Rice Environments (CURE), 24-26 May. Funded by the International Fund for Agricultural Development (IFAD), CURE, a “network of networks,” focuses on rice farming systems where low and unstable yields are common and extensive poverty and food security prevail. Climate-smart rice can withstand the ill effects of drought, flooding, and salinity that pose great threats to rainfed rice areas. Aside from being more resilient, climate-smart rice varieties have other outstanding qualities. De Luna said that the government will ensure the availability of seeds of climate-smart rice varieties and will promote their use in less favorable areas through informal seed systems such as community seed banks. Lakbay Binhi is another way of making these climate-smart varieties more accessible to farmers, according to Protacio. Lakbay Binhi (traveling seeds) is a project that brings high-quality seeds to Filipino farmers through mobile seed centers. It was pilot-tested at three sites affected by Typhoon Lando (Koppu). CURE is also helping 100 million farm households dependent on rice in unfavorable environments in Cambodia, Lao PDR, Indonesia, Thailand, Vietnam, Myanmar, India, Bangladesh, and Nepal. “Indeed, CURE provides an integrated platform to help the poor farmers in unfavorable rice areas in Asia by creating, validating, disseminating, and adopting new rice technologies for adverse environments,” said Agriculture Secretary Proceso Alcala. “Undeniably, the platform has become a beacon of hope for resolving key problems in rice farming systems through strengthened partnership among the national agricultural research and extension staff, IRRI researchers, farmers, and extension workers. ODISHA, India—Shri Manoj Ahuja (second from left in photo), principal secretary of the Department of Agriculture and Farmers’ Empowerment (DoA), Government of Odisha, commended the introduction of two stress-tolerant rice varieties in the state. The International Rice Research Institute (IRRI) has introduced flood-tolerant BINA 11 and drought-tolerant DRR 42 in Odisha for the 2015-16 rabi season through the IRRI-coordinated projects Cereal Systems Initiative in South Asia (CSISA) and the Stress-Tolerant Rice for Africa and South Asia (STRASA). CSISA and STRASA, in collaboration with DoA, planted BINA 11 and DRR 42 using a mechanical rice transplanter and seed drill under best management practices on 200 hectares and 100 hectares, respectively, in Puri, Bhadarak, and Balasore Districts. The projects, both funded by the Bill & Melinda Gates Foundation, showcased the stress-tolerant rice varieties and associated technology options so farmers can observe and evaluate their performance.The critical role of service providers of mechanical rice transplanters and seed drills was also discussed with the farmers. These machines help farmers plant rice on time, alleviate labor shortages, and reduce the cost of rice cultivation. Ahuja, along with national partner scientists Dr. J.K. Roy, Dr. Ashok Kumar, teams from CSISA and STRASA, and officials of the DoA visited farmers’ fields in Kahanapur and Kunarpur villages in Puri, and Sisolo Village in Khorda District on 30 April. Ahuja noted the enthusiastic response and feedback from farmers regarding the varieties. The participating farmers were excited when they found that these varieties can still be planted even during the ensuing kharif with their own seed produced in the current dry season. With proper roguing and procurements, the seeds of BINA 11 and DRR 42 produced in the current dry season will be sufficient to cover around 30,000 and 12,000 hectares, respectively, in the ensuing wet season of 2016. BINA 11 is a high-yielding variety that is suitable for low-lying flood-affected areas. It matures in 120–130 days, and has good grain quality. It can potentially replace Lalat, a traditional variety that is commonly grown during the dry season. BINA 11 is superior to the traditional variety in terms of numbers of tillers, length of panicle, and number of seeds per panicle. Based on present crop status, discussion with farmers, and initial crop cut data, the average grain yields of BINA 11 and DRR 42 are around 5.5–6.0 and 5.0–5.5 tons per hectare, according to Dr. Narayan Banik, IRRI agricultural research and development specialist based in Odisha. The principal secretary also showed interest in seeing more progress in addressing fallow lands based on cropping systems with green gram, mustard, maize, and sunflower layered with mechanization, improved technologies, and best agronomic practices. Ahuja, in particular, focused on the skill improvement and capacity building of the stakeholders and the DoA extension staff, using the Transfer-Operate-Transfer model supported by simple print materials. He assured stakeholders of his department’s support for continuing and upscaling such efforts across Odisha in the future and suggested continuous interactions and regular updates. Ahuja commended IRRI for its consistent support extended to Odisha farmers, not only through developing stress-tolerant rice varieties but also demonstrating their performance in farmers’ fields. MANILA, Philippines—As part of its objective to promote continuing education and foster camaraderie among its members, the Society of IRRI Non-Research Professionals (SINoP) organized a heritage tour in celebration of Philippine National Heritage Month on 22 May. The one-day activity started with a tour of the Intramuros Light and Sound Museum in the city of Intramuros, the oldest district and historic core of Manila. Through the museum's visual display, sound effects, and animatronics, SINOP members were transported back in time from the precolonial period to the Spanish era and the martyrdom of the country’s national hero, Dr. Jose P. Rizal. Afterwards, the group walked the streets of Intramuros and visited Casa Manila for a glimpse of how the residents of the walled city lived during Spanish times. The group then proceeded to the nearby Binondo District, the world’s oldest Chinatown. Binondo was established by the Spaniards in the 1594 for Chinese Catholics. Apart from its historical significance, Binondo is a thriving commercial and cultural center that SINOP members experienced through the countless food stalls and restaurants offering classic Chinese cuisine and the busy street market scene. From Chinatown, the historical tour headed to the Fine Arts Gallery of the Philippine National Museum where SINOP members learned more about history through the artworks of the masters. Of course, a trip to the museum will not be complete without visiting the IRRI Hall that features the institute’s Manansala murals and studies, The murals, on loan to the museum, were declared as National Cultural Treasures, the highest recognition for works of art that play a significant role in defining the identity of the Filipino people. The final destination of the heritage tour was Rizal Park and the memorial of the Philippine national hero. Formerly called the Luneta National Park, Rizal Park is one of the largest urban parks in Asia. It is the site of Dr. Rizal’s execution in 1986, the declaration of the Philippine Independence from the United States in 1946, and the Quirino Grandstand where Philippine presidents take their oath of office. Overall, the heritage tour gave SINoP members a better understanding of the present because of the new things they learned about the country’s past. MAGSAYSAY, DAVAO DEL SUR, Philippines—Sahod Ulan 6, a drought-tolerant rice variety developed at the world’s leading rice research center, received high scores for its characteristics from farmers in Magsaysay during an evaluation of six new rice varieties. Sahod Ulan 6 topped five other varieties where 32 farmers rated each one based on their preference and sensory evaluation of uncooked and cooked rice as part of a participatory varietal selection (PVS) activity in the province. Grown under rainfed conditions in Magsaysay, the six varieties were evaluated for their field performance, appearance of milled grains, and sensory features. Sahod Ulan 6 (NSIC Rc280) ranked first in aroma, taste, aroma, texture, color, gloss, and cohesiveness. It also ranked first in three other sensory trials in Davao del Sur. Sahod Ulan 6 was developed by the International Rice Research Institute (IRRI) for rainfed lowland areas. Released in 2011, the variety can produce yields of up to 5.6 tons per hectare. It matures in 123 days and is moderately resistant to white stem borer and yellow stem borer. The sensory tests, held on 31 March, were conducted by the project, Accelerating the development and adoption of next-generation (NextGen) rice varieties for major ecosystems in the Philippines. NextGen promotes the farmers’ adaptation of high-yielding rice varieties suitable for each local ecosystem. The project is an initiative under the Food Staples Sufficiency Program of the Philippine Department of Agriculture (DA) and is being implemented jointly by IRRI, the Philippine Rice Research Institute, and local DA-Regional Field Offices. LOS BAÑOS, Laguna, Philippines—Taiwan’s agency for cooperative development projects and the world’s leading rice research center have launched the first in a series of workshops for improving rice productivity in developing countries. The effort is part of an agreement between the International Cooperation and Development Fund (TaiwanICDF) and the International Rice Research Institute (IRRI) to implement training courses in managing soil, water, and nutrients. The initial two-week workshop is on Rice postproduction and marketing, which opened on 16 May. The participants--representing research, extension, and nongovernment agencies and the private sector--are being introduced to the many challenges affecting rice postproduction. These include identifying and measuring production and postharvest losses; evaluating technologies for harvesting, threshing, drying, storage, and milling; and learning how to use methodologies and tools to assess local postharvest chains and map actors and set up business plans to introduce or disseminate suitable technologies. The course is being coordinated by Martin Gummert, head of IRRI's Postharvest Development Unit; Eugenio Castro, Jr., senior manager at the Training Center; and Christopher Cabardo, IRRI associate scientist. In August, IRRI will be implementing at its headquarters a 3-week TaiwanICDF training course on seed capacity and extension. It will focus on building knowledge and skills for the development of seed systems. It will provide an overview of IRRI’s work in the seed sector including germplasm maintenance and utilization of diverse genetic resources; the International Network for Genetic Evaluation of Rice (INGER) and the processes of germplasm exchange; and IRRI’s experiences in the development of seed systems and the introduction of new varieties into countries through projects like the Stress-Tolerant Rice for Africa and South Asia (STRASA) and the Consortium for Unfavorable Rice Environments (CURE). The course will be offered to representatives of TaiwanICDF’s partner countries: Haiti, Nicaragua, Myanmar, and Papua New Guinea. The third workshop, on seed production, will be held later this year in Myanmar. TaiwanICDF works closely with the Myanmar government and local cooperation units to carry out cooperative projects based on the country’s national development priorities. The Government of Myanmar has identified agricultural development as one of the keys for supporting and enabling inclusive and sustained economic growth. To achieve agricultural development, Myanmar's Ministry of Agriculture and Irrigation, with technical assistance provided by IRRI, has developed the Myanmar Rice Sector Development Strategy that seeks to boost rice production, ensure food self-sufficiency, and gain a larger share in the international rice trade for the country. Fangming Xie (third from right in photo), senior scientist at IRRI and coordinator of the Hybrid Rice Development Consortium, joined six young researchers for lunch on 18 May. Dr. Xie, a plant breeder with many years of experience working in Asia and North America, has provided strategic leadership and oversight to IRRI’s hybrid rice research and development and has developed hybrid rice parents, germplasm, and hybrid varieties for commercial production. He has also received scientific awards for his achievements and patented hybrid rice products in the United States. Dr. Xie earned his PhD in plant breeding at the Texas A&M University and worked at RiceTec before coming to IRRI. During the lunch, Dr. Xie shared his intriguing story on working on a farm at age 17 in China for 3 years during the Cultural Revolution. He then went on to earn his BS and MS degrees with Dr. Yuan Longping, the Chinese agricultural scientist and educator known as the "Father of Hybrid Rice," for his development of the first hybrid rice varieties in the 1970s. At IRRI since 2005, Dr. Xie is leaving the institute to work again with Dr. Longping in Changsha, China. Dr. Xie also shared many interesting facts about hybrid rice production, including the current use of helicopters and drones for pollination, as well as the policies of the Chinese government that require farmers to grow certain varieties. The luncheon participants were Joseph Sandro, Kimberly Ponce, Gudina Legese Feyisa, Nitika Sandhu, Yang Jiang, Hongkai Wu, and Lingli Zhang. NAY PYI TAW, Myanmar, 13 May—A project that promotes the adoption of new stress-tolerant rice varieties, greater crop intensification, and diversification, and postharvest management for smallholder farmers in the Ayeyarwady Delta has led to important developments in the local agriculture, according to farmers. The project, Diversification and Intensification of Rice-based Cropping Systems in Lower Myanmar (MyRice), aims to improve farmers' profitability in Maubin and Daik Oo Townships in the Ayeyarwady and Bago regions, respectively, The project is funded by the Australian Centre for International Agricultural Research (ACIAR), in partnership with the International Rice Research Institute (IRRI), the Department of Agriculture (DoA), the Department of Agricultural Research (DAR), and private sector partners. Led by IRRI scientist Grant Singleton, the project is developing best practices for rice production, including postharvest management and innovative approaches to improve the productivity of rice-rice and rice-pulse cropping systems. Launched in 2012, MyRice received positive evaluations from its mid-term external review in May 2015. The project introduced stress-tolerant varieties of rice and pulses in the two-crop system and best management practices including postharvest management. Farmers and partners from the Ministry of Agriculture, Livestock, and Irrigation (MoALI) in the two townships identified the introduction of these two technologies as important developments. The project has also supported the research theses of 17 MSc students from DoA and DAR enrolled at the Yezin Agriculture University (YAU). “Building farmers' capacity is a long-lasting investment that is continuously helping improve the country's agricultural programs,” said Dr. Tun Winn, MOALI deputy minister. Winn, a former IRRI scholar, thanked the institute for its continued support and assistance to Myanmar. Meanwhile, Dr. Ye Tint Tun, director general of DoA, requested IRRI to further develop profitable rice and rice-mixed cropping systems, especially at the community level. “The great progress by IRRI and Myanmar partners in developing climate-ready varieties and the associated best management practices needs to be expanded for the benefit of all small-holder farmers,” he stressed. The accomplishments of the project’s adaptive research and related activities were presented early this year in Ayeyarwady and Bago along with new activities for a full-cost extension through December 2017. On 13 May, the research outputs and the regional plans were presented to the officials of the MoALI at DAR in Nay Pyi Taw (photo). Plans for the outreach and outscaling activities for each region were formulated by the DoA staff at the district and township levels. The occasion was graced by Dr. Myo Kywe, rector at Yezin Agricultural University; MoAI officials, the project’s scholars, and private industry partners. Ninety-two participants joined the activity, of which 57 were women. Also on hand were IRRI representatives Drs. David Johnson, Grant Singleton, Romeo Labios, Jongsoo Shin, Nyo Me Htwe, U Than Aye, Daw Ohnmar Tun, Daw Su Su San, U Yan Linn Aung, U Aung Myo Thant, U Hlwan Oo, Daw Aye Sabai, and Daw Hsu Myat Noe Hnin. during her visit to IRRI headquarters on Thursday (12 May) . LOS BAÑOS, Philippines—Philippine Senator Loren Legarda urged the International Rice Research Institute (IRRI) to work with government agencies to create more Climate-Smart Villages, build rice seed nurseries, and organize capacity-building workshops for farmers. Legarda’s call for urgent action on Climate-Smart Villages was prompted by the recent unrest among farmers in drought-stricken areas of Cotabato province on the southern island of Mindanao. Legarda, who chairs the Committees on Finance, Climate Change, and Cultural Communities, visited the institute on 12 May where she was briefed on IRRI’s research agenda, with a focus on climate-smart and heirloom rice varieties. "I want to have, if not the whole country, some prototypes of Climate-Smart Villages, replicating what you've done in Cambodia, Laos, Vietnam, and other countries,” she said. A Climate-Smart Village is a community-based approach to minimize the impact of climate change through interventions that fit the local context and engagement with stakeholders. The idea is to mainstream climate-smart interventions into village development plans with the use of local knowledge through local institutions to address the triple challenges in agriculture. These are improving food production (quality, quantity, and diversity), adapting to climate change and contributing to mitigating greenhouse gas emissions. “Why not implement these in the Philippines? We'll find the funding,” Legarda added during a discussion with Dr. Jackie Hughes, deputy director general for research; Dr. Bruce Tolentino, deputy director general for communication and partnerships; Dr. Reiner Wassmann, IRRI’s climate change expert; and Drs. Casiana Vera Cruz and Digna Manzanilla, leaders of the Heirloom Rice Project. "Let's go local; I mean grassroots,” said Legarda. “Not just regional, but let's get down to the barangay level. Let's do it together with the Department of Agriculture (DA) and the local governments of those towns where we should best implement these climate-smart measures." Legarda also inquired about drought- and flood-tolerant rice varieties, water-saving technologies, and climate-smart apps that farmers can use. The senator pointed out that El Niño and La Niña are nothing new and that governments should have been using the technologies developed by IRRI. Moreover, she was also keen on crafting a water-use efficiency bill. "In fact, my dream is to have all the water agencies, which are all over in different agencies under one agency. If we can have a water efficiency bill, which is so important, IRRI could help me draft that," Legarda said. Tolentino promised to get back to her with a set of concepts that proposes and integrates possible areas of collaboration. “IRRI’s technologies are there for the taking since we are an international organization with a purely public purpose,” he said. "We have some activities going on right now that relate to water-saving work with the DA under the country's Food Staples Sufficiency Program (FSSP). But it's really, really small and we need to expand it." Another FSSP activity discussed with the senator was the Heirloom Rice Project. She lauded IRRI’s partnership with the DA in identifying, preserving, and propagating traditional rice varieties in the Philippines, particularly in the Cordillera Region. Legarda also launched cultural galleries with the National Museum, which include the Rice, Biodiversity, and Climate Change exhibit. BHUBANESWAR CITY, ODISHA, India—The project, Stress-Tolerant Rice for Africa and South Asia (STRASA), is the platform for coping with current food security challenges. "The Bill & Melinda Gates Foundation is very grateful to the STRASA leadership and partners in this very large network encompassing dozens of scientists and dozens of research programs across the region to develop and deliver products to needy farmers,” said Gary Atlin, senior program officer, Agriculture Research and Development, Global Development for the Gates Foundation, in his remarks during STRASA's recent review and planning workshop. STRASA held its Phase 3 second annual review and planning workshop on 25-28 April at Odisha City's Mayfair Lagoon Hotel. The first two days were dedicated to project evaluation and planning based on the major objectives—tolerance for drought, submergence, and salinity and seed delivery. There were also sessions on cross-cutting activities including biotic stresses, grain quality, and nutrition. Other pertinent topics included monitoring and evaluation; gender; varietal tracking and adoption; targeting and monitoring through GIS; and communication, awareness, and information sharing. The latter part was held as a plenary session on the second day followed by a session on STRASA's products and advancement strategies. The plenary session of the Annual Review and Planning Meeting was held on the third day. The inaugural program was highlighted with remarks from Mr. Manoj Ahuja, principal secretary (agriculture), Government of Odisha; Prof. Surendranath Pasupalak, vice chancellor, Orissa University of Agriculture and Technology; and Dr. J.S. Sandhu, deputy director general (crop science), Indian Council of Agricultural Research. “Strong ownership and leadership from all of you make STRASA work,” said Dr. Abdelbagi Ismail, STRASA's overall project leader and principal scientist at the International Rice Research Institute (IRRI). “How we move varieties from one country to be released in another without further testing has not happened in the world before. This variety sharing is now a reality in South Asia,” he added, thanking the group for this milestone work. In his inaugural address, Dr. Gurbachan Singh, chairman, Agricultural Scientists Recruitment Board, underscored the many activities that IRRI and India’s national agricultural research systems have achieved and continue to work on, from varietal development to rice biofortification. “STRASA has contributed significantly to boosting rice production while providing opportunities for all its participants and stakeholders to make better choices,” Singh said. He is looking forward to more project successes in bringing stress-tolerant varieties to farmers and in helping solve complex climate change-related problems. Discussed at the plenary session were outputs and updates that came out of discussions during the first two days as well as progress in South Asia and Sub-Saharan Africa. The work in South Asia was presented by Dr. Uma Shankar Singh, STRASA South Asia regional coordinator; Dr. Baboucarr Manneh, STRASA coordinator in Africa, gave the African updates. Some key partners were recognized for their outstanding contributions to the successful implementation of STRASA in their regions. They were Dr. Dinesh K. Sharma, director of Central Soil Salinity Research Institute in Karnal; Dr. Tilathoo Ram, rice breeder, Indian Institute of Rice Research in Hyderabad; and Dr. Mohammad Abdul Bari, outgoing country and project manager in Bangladesh. Dr. Sharma has provided leadership and support for the development, validation, and dissemination of rice varieties and pertinent technologies for salt-affected areas. Dr. Ram has had substantial involvement in the development and promotion of drought-tolerant rice. Dr. Bari was acclaimed for his notable leadership and dedication to STRASA and his exceptional strategic input into the project, leading to its remarkable success in Bangladesh. His initiative and aspiration to help needy farmers and his inspiration and support for staff and partners are much admired. The last day of the event was capped with the planning meeting of a project associated with STRASA, the EC-IFAD-funded project, Improved Crop Management and Strengthened Seed Supply System for Drought-prone Rainfed Lowlands in South Asia. This was followed by the STRASA Monitoring and Evaluation (M&E) Workshop for South Asia. Dr. Sudhanshu Singh, IRRI senior scientist and rainfed lowland agronomist for South Asia, facilitated the EC-IFAD meeting. Dr. Hope Webber, M&E specialist and IRRI senior scientist, conducted the M&E workshop. Wrapping up the event, Dr. Uma Singh thanked the 175 participants who attended the four-day event. He also acknowledged the hard work of the different STRASA teams and staff and the partners who contributed greatly to the project’s accomplishments to date. BATTAMBANG, Cambodia, 30 April—Cambodian rice farmers will soon have access to sustainable rice straw management techniques that will curtail the air pollution and potential health risks associated with rice straw burning. The Cambodian Ministry of Agriculture, Forestry and Fisheries (MAFF), the Don Bosco Agro-Vocational School (DABVS), and the Postharvest and Mechanization Unit of the International Rice Research Institute (IRRI) organized a technology demonstration event for extension agents, government agencies, the private sector, and NGOs in Cambodia to help promote better options for rice straw management. The event (photos), conducted at the DABVS model farm, showcased a rice straw baler machine for collecting the straw in the field, spraying urea or Trichoderma fungi to hasten the decomposition of rice straw, and mechanical equipment for chopping and dispersing rice straw into mulch. These technologies drew a lot of interest from the participants. The rice straw baler technology from Vietnam, in particular, opened a possibility of developing business models to add value for farmers on the use of rice straw either as feedstock or for mushroom production. However, smoke from burning rice straw contributes to air pollution that causes acute and potentially serious health problems. “Moreover, burning rice straw in the field brings minimal benefits to the soil with the addition of potassium silica from charred straw and ash,” said Walter Zwick, senior expert on agronomy from Germany, who is helping in the operation and management of the DABVS model farm. The project team discussed the next steps for Cambodia, Vietnam, and the Philippines, which will focus on the promotion of a rice straw baler and further studies on Trichoderma and mushroom production. The project, Scalable straw management options for improved farmer livelihoods, sustainability, and low environmental footprint for rice-based production systems, is funded by the Federal Ministry for Economic Cooperation and Development of Germany (BMZ), which supported the technology demonstration. KATHMANDU, Nepal—As part of its Silver Jubilee, the Nepal Agricultural Research Council (NARC) acknowledged the "tireless contribution" of Dr. Arvind Kumar (photo left) in improving drought-tolerant rice varieties (photo below) and making them available to Nepalese farmers. Kumar, a senior scientist at the International Rice Research Institute (IRRI), leads the South Asia plant breeding group for the rainfed lowlands at the institute. He has expertise in trait development for drought, aerobic rice, and dry direct seeded rice. He also improved several popular rice varieties for drought tolerance as well as developed a drought plus submergence-tolerant version of the popular Indian rice variety Swarna. NARC will recognize Kumar in person on 7 May. Nepal has released six drought-tolerant rice varieties (Sukha Dhan 1-6) and two submergence varieties (Swarna-Sub1 and Shamba Mahasuri Sub 1). These climate change-ready varieties have gained much popularity and are spreading to large areas of the Nepal Terai and river basin. The varieties have made a significant impact in minimizing the risk of major stresses that affect poor farmers in the country. Some of the successful collaborative projects between NARC and IRRI include water-saving, stress-tolerant rice for Africa and South Asia, and accelerating the adoption of stress-tolerant rice varieties.